There are many myths we have been taught to believe about the police, and some of them come from within our own communities. One of my uncles, who is currently unemployed, worked as a police officer and security guard for most of my young life. He dropped out of high school to join the Marines, and has been working in military, state and private law enforcement ever since. Tagging along with him to visit his office when I was little, and meeting many of his cop and military friends while I was growing up, I learned early on not only about the economic straights that all these (in this case) men had in common, but also the distinct personality traits they shared–traits which made them ideal recruits for the military and for the police force. I learned that the erratic anger and tendency toward violence which made my uncle a dangerous spouse earned him respect in positions where excessive force was an expectation. I learned that the feelings of inadequacy and powerlessness which had made school and home such alienating places for him, helped him to find solace in institutions which offered to give him back that power in exchange for becoming a limb of the violent state apparatus. In short, I came to understand that all the things which made my uncle a problematic community member were the exact things that made him a good cop, and that the forces which had drawn him into his work were decidedly aware of that fact. Several recent bouts of extreme police violence in protests around the nation have re-sparked conversations in radical and activist communities about frustrations with and hatred of the cops. For those of us who are members of communities where a police presence is a constant and not a static event, these conversations have never stopped happening. As someone who has been arrested on false charges and spent time on probation, who has been harassed and has watched countless members of my immediate community be harassed by law enforcement, and who views cops not as protectors but as figures of suspicion and danger, I understand and respect these feelings. But as someone who was raised in a military family and who was cared for and nurtured by members of the police force, I want to push my community to think differently about our relationship to the cops. I do not want to deny the necessary role that police officers play in the perpetuation of oppressive political and economic orders. It must be acknowledged that from its inception in feudal Europe, to its birth on this continent in the wake of the abolition of slavery, law enforcement has never, in reality, been about enforcing laws, but about protecting the property and interests of the powerful, and maintaining order amongst marginal communities through violence. (On that note, we should also acknowledge that just this past month JPMorgan gave away 4.6 million dollars to the NYPD, as countless other banks and large corporations do annually, a fact which should tell us exactly whose law is being enforced.) Recent initiatives in New York City and other areas have actively sought to recruit more police of color and from immigrant backgrounds, with the stated hope that they might be met with less venom from the brown and immigrant communities whom they would inevitably be targeting. All this is to say that I do not want to challenge the inherently oppressive role which police play in our communities, but rather how they come to occupy those roles, and who benefits from their doing so. Police officers, so much like their counterparts in the military, often join the force out of great economic necessity, and because they feel powerless in their own personal lives. The bodies which lure them there prey on their social, racial and economic marginalization, offering them the control and authority which they have never felt in their own lives. Once there, they are made to work long hours doing life-threatening work, for which there are paid very little. They are as expendable as workers as their lives are in the line of duty, suffering the same layoffs, cutbacks and benefit slashes as all other working people and state employees–which is, incidentally, how my uncle lost his job. Their bodies and identities are abused, as they are increasingly handpicked from oppressed communities in a conscious effort by the state to mask the racial, geographic and class-based oppression that is law enforcement. My question, then, is, though police pose an inherent threat to radical activism and oppressed communities, how do we come to reconcile that fact with their own oppression as a working class and state-abused collective? What might a movement look like which both acknowledges the oppressive legacy of law enforcement, but also works to align itself with police officers? What knowledge and resources can police offer which might be useful to struggles for social justice? I think these questions are particularly pertinent ones for teachers who also see themselves as organizers and activists. Haven’t we also joined in with the state because many of us believe it is a way to support ourselves and our families while also doing work which we think is valuable to our communities? Aren’t we also necessary cogs in the state apparatus, hoping to subvert its oppressive machinery? If we believe that there is radical potential in the work that we do, can’t we find that same potential in other state-sanctioned jobs and positions? Barbara and Beverly Smith–two renowned brown, queer feminists–are famous for arguing that separation and alienation are the status quo in our political history, and that the most radical thing we can do as activists and organizers is to form allegiances and alliances between exactly those oppressed communities which are expected to struggle against one another. Police are a detriment to justice for our communities, but they are also a part of those very communities, members of our own families, and I believe a truly radical struggle should fight to address and incorporate them rather than constantly antagonizing them. We need to start recognizing police as employees of the state–like so many of us are–whose rights are just as abused as our own, and who might be our allies if we can find creative ways to join with them in radical alliances. Spot on. I spent 4 years in the Marines, got offered jobs in law enforcement before i got out, some places would have had me on the job within weeks of being discharged. At the time (2005) i had just spent my second year in Iraq fighting, and had been back in the states for less then 6 months…..I declined. 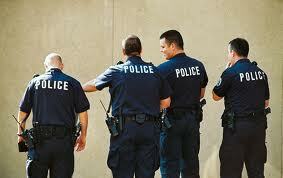 My tendency is to say ACAB, but your story is convincing, and i would agree with you on the need to relate with our brothers and sisters in uniform, sharing the burden of oppression with them, until they understand, and take on their roles, as oppressed peoples, in the alleviation of oppression for all. Thanks for the post and the space to comment. Thank you so much for reading and sharing your thoughts! They are really appreciated.